I've got the code and the makefile and one pic for the traffic light. Where is the "wireing breadboard" diagram. I based mine off the temp sensor program, then if you read the code there are some comments at the top, telling you what leds etc are wired to what pins. 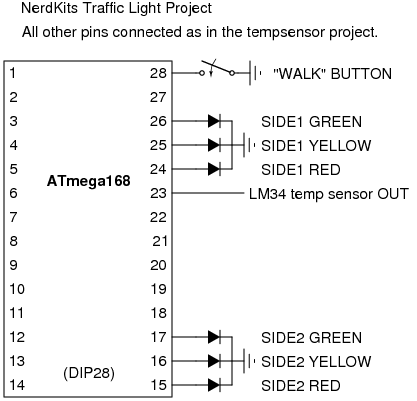 Have a read through, if you're still stuck, set up the temp sensor project (although you may be removing some parts for this project), then let me know, I'll see if I can remember how I did it. I got through the temp sensor ok, and looked again but no wireing drawing for the traffic light. Unless were supposed to know by now. But this will draw a lot of current into the LEDs and your batteries won't last too long -- see also this forum thread.